DIVINE CHRISTIAN GIFTS - Cinnamon Scented - Holy Family Christmas Blessings Candle. 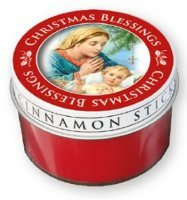 Cinnamon Scented - Holy Family Christmas Blessings Candle. Christmas nativity blessing candle, cinnamon scented with tin lid and a plastic polycarbonate container. Burning time : 25 Hours.